With everyone feeling so cash strapped at the moment, it’s good to hear about genuinely effective working partnerships (cover story, page 8). Adfam’s conference brought together representatives from all areas of family support – not just those working directly in drug and alcohol treatment, but professionals with expertise in parenting, child poverty, schools and prisons.They looked at issues from family members’ perspectives, and shared knowledge and expertise. We may be looking across a very uncertain commissioning landscape but it’s good to see a commitment to collaboration that gives essential services the best chance of overriding tough times. On the subject of family support, Kate Halliday from SMMGP (page 20) and Sarah Brighton from Swanswell (page 21) believe the family doctor is in a unique position to provide drug and alcohol treatment alongside regular healthcare, while on page 12, Hannah Shead gives a working example of incorporating mothers with small children into the treatment model. Adfam chief executive Vivienne Evans talks about how family services are coming under increasing threat in the current political climate (profile, page 18), but how worried should we be about changes ahead for the entire drug and alcohol field? Read Marcus Roberts’ Soapbox and let us know what you think. The government’s alcohol strategy is finally with us. DDN assesses the reactions. 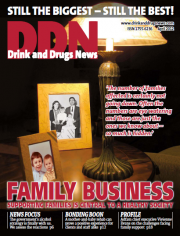 The importance of supporting families and parents was a sentiment echoed by speakers from all areas of family support at Adfam’s conference, as DDN reports. A mother-and-baby rehab can prove a positive experience for clients and staff alike, explains House’s Hannah Shead. Jeremy Adderley reports from the inaugural Crew Substance Use Symposium. Kim Johnson describes how Helping Groups to Grow is tackling the problems faced by people with dual diagnosis. Adfam chief executive Vivienne Evans talks to David Gilliver about the challenges facing family support in a world of tight budgets and political change. Ignore primary care based drug and alcohol treatment at your peril, says Kate Halliday. Putting people in charge of their recovery and actively.